Hello everyone! Today on the Paper Issues blog we are featuring the Simple Stories "Posh" Collection. I LOVE this collection. Dark blues are my favorite right now. I chose to feature a birthday picture. There are lots of confetti type pages but I had to use this flower paper. I love how Simple Stories supplies pages with cards you can cut out and use for layering or journaling or fussy cutting. My biggest problem ends up that I want to use everything! 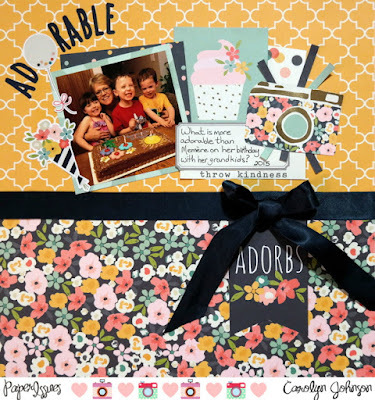 I was hooked on the 'adorbs' card and decided to use that as the title and journaling topic. The ribbon was in my stash. Thanks for stopping by! The Paper Issues Store has lots of Simple Stories Posh supplies. Feel free to check it out and use the code Carolyn with any purchase for 20% off.